Frost Fighter® defroster repair solutions make it easy to repair, replace or even install new rear window defrosters the right way. Separated Defroster Tab? Damaged Grid? Replacement tabs? Need a complete defroster? Rear window defrosters break. Things happen. Scratch the grid or snap off a tab and you can pay hundreds of dollars for a new rear window or struggle with a less than perfect defroster repair – but why? 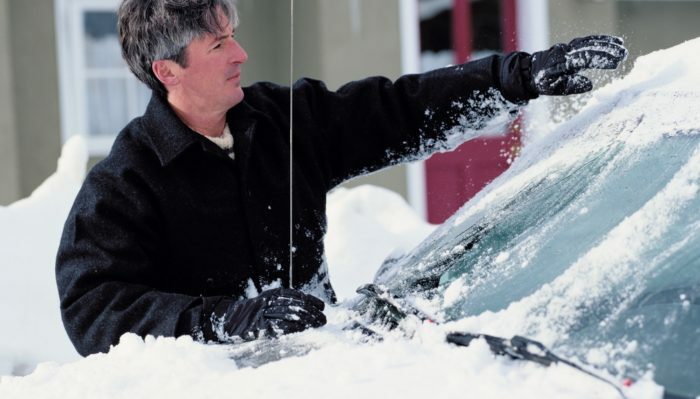 We offer solutions to every rear window defroster repair challenge. See our Defroster Repair Fix It Guide. Developed with the same care used in mission-critical electronics, Frost Fighter Defroster repair kits use advanced silver conductive coatings and adhesives specifically designed for defroster repair. 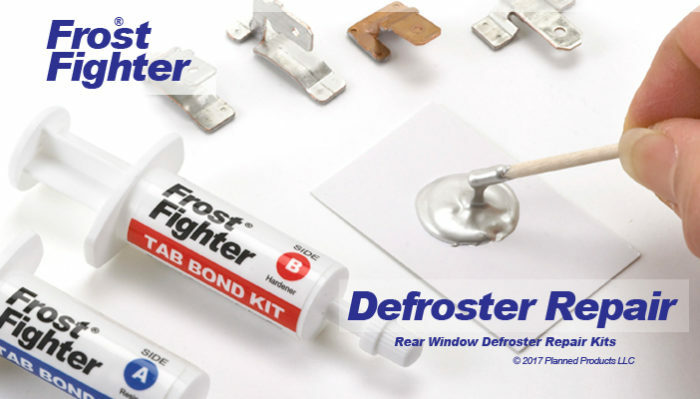 The Frost Fighter Tab Bonding Kit is a good choice to re-attach defroster tabs, and our replacement defroster tabs match a variety of vehicle types, including Ford, Chrysler, Dodge, Jeep, Toyota, Honda, and many others. 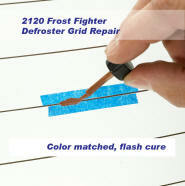 Repairing damaged defroster elements is easy with the 2120 Frost Fighter Grid Repair Kit. The Clear View defrosters are self-applied, drop in defrosters that make it easy to add heating directly to windows or replace damaged factory defrosters.ThermaSync defroster and heated mirror controls are ideal for adding a defroster or heated mirror to your vehicle for the first time. for the right defroster repair solution. When a metal defroster tab comes off – the defroster stops working altogether. Easy to repair with the 2000 Tab Bonding Kit. 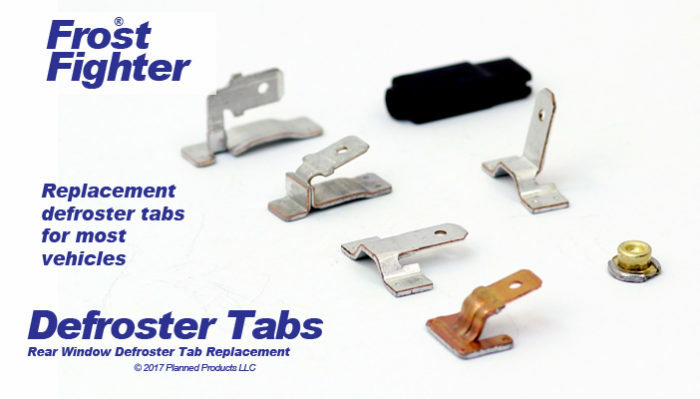 Re-Attach rear window defroster tabs and clips using the kits highly conductive silver adhesive making the electrical and structural connection in one simple operation. 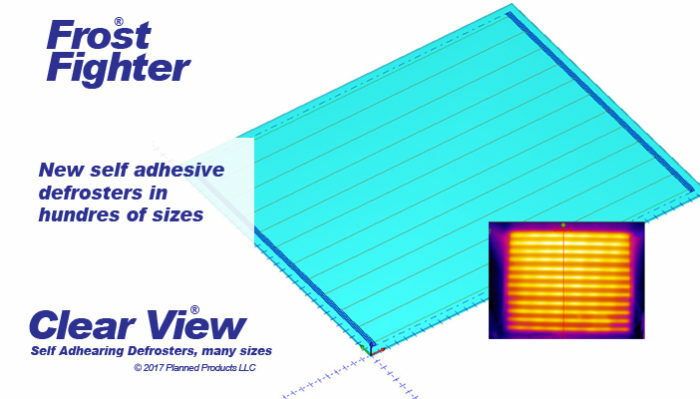 The conductive silver adhesive bonds aggressively and provides reliable high amperage defroster tab bonding. This is our best seller because it works. 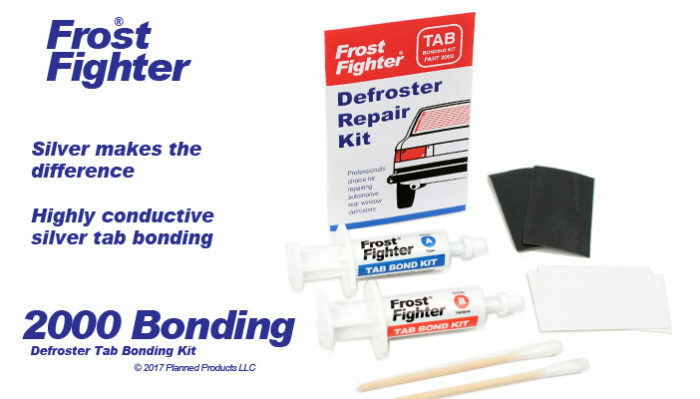 General Motors bulletin recommends 2000 Frost Fighter Tab Bonding Kit. New General Motors (GM) Bulletin 16-NA-171: Repair Information of Reconnection of Rear Window Defroster Contact or Tab. This bulletin recommends the 2000 Tab Bonding Kit for the reconnection of defroster terminals to the rear defroster. Part of the defroster not working? Damaged grid elements mean one or more of the defroster elements stops working. NEW/IMPROVED! 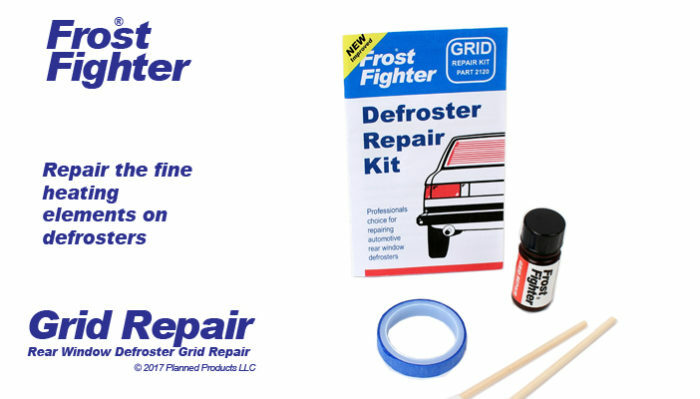 Use the Defroster Grid Repair Kit to repair damaged defroster grids. Easy to use with enough material for large areas. Now with Flash Cure and better performance. Missing Defroster Tabs, Clips or Connectors? Defroster tabs can be lost or damaged. 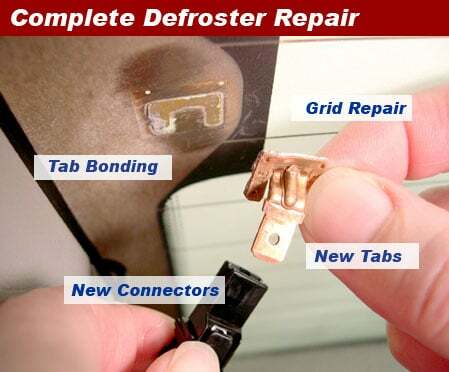 Frost Fighter defroster tabs and connectors include four of the most common designs for Ford, Honda, Toyota, Nissan, Subaru, GM, Chrysler and many others. New defroster tabs and connectors. The Uni-Clip Tab and Uni-Con Connector kits provide factory replacements for these hard to find parts. If you need the best all-in-one defroster repair kit the Master Defroster Repair Kit is it. 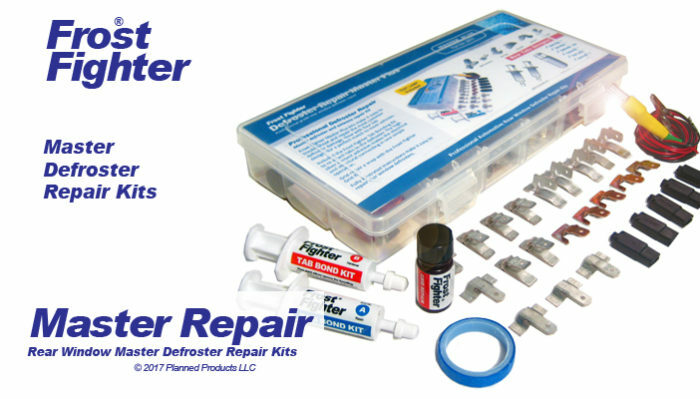 The Pro and Master kits were developed for professionals and includes everything needed to repair the most common rear window defroster problems. Even includes the Frost Fighter test lamp! 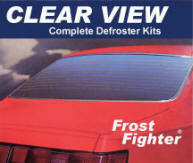 See the new Master Defroster Kits. Clear View defrosters are now available for a remarkable variety of applications including van rear windows, pickup trucks, the front window wiper parking area, bus destination signs, bus front windshield defrosters, side windows, equipment cabs, tractors and industrial equipment. There is no end to the window defrosting options available. See these specialty defrosters tailored to meet specific defroster challenges. New! Clear View II Defrosters! Complete window defrosters in hundreds of new sizes to fit any vehicle. Now in 12 and 24 Volt. Easy to install Clear View II defrosters are trimmed to size during installation for a custom fit with an attractive factory look. Updated and improved Clear View II defrosters match the heating performance of factory installed rear window defrosters clearing snow and ice in minutes. New ThermaSync defroster controls are plug are ideal for vehicles with no defroster circuitry or to replace existing defroster controls. Available in four models from simple automatic timing to more sophisticated units with power modulation, adjustable automatic timing and one switch control of multiple defrosters. Available in 12 and 24 volt. 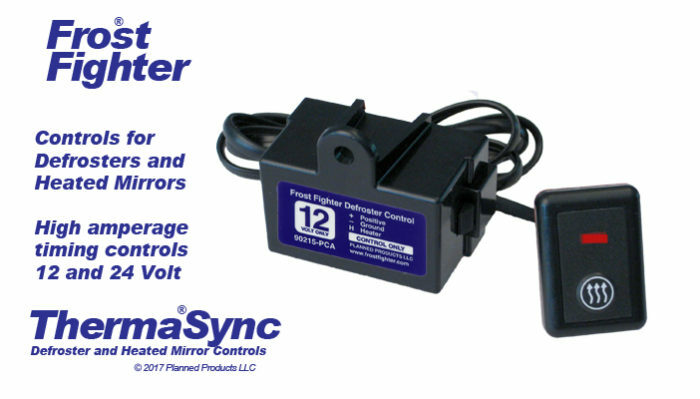 See more on ThermaSync defroster controls. Make rear window defroster installation a snap! NEW! ThermaSync defroster wire harness and installation pack makes it easy to install ThermaSync defroster controls. Ideal for vehicles with existing defrosters but no defroster control circuitry. The wire harness includes color coded connectors sized to fit ThermaSync defroster controls – and the defroster.